Koh Chang Thai Cooking Schools are another popular way to spend a day off the beach, with a handful of places offering comprehensive instruction in everything from the raw produce, to ingredients, to techniques and presentation. Curry pastes are integral to all Thai curries, so learning how to make them is usually the basis of all classes. This involves an introduction to the core ingredients such as Thai red onions and Thai garlic, galangal, lemon grass and kaffir lime, followed by their preparation and finally the hard pestle and mortar work of grinding them into a paste. Once you’ve mastered and completed that, you move onto the actual assembly and cooking of the classic red, green or Massaman curries themselves. Other dishes taught often include soups like Tom Yam or Tom Kha Gai, while the perennial favourite Pad Thai is usually in the mix somewhere. Mango and sticky rice is a very popular choice as the dessert. 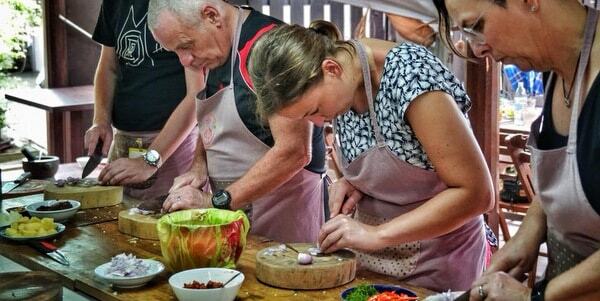 The teaching is not just restricted to these dishes though and each of the cooking schools also offer unfamiliar recipes, which help broaden your knowledge of Thai cooking overall. At the end of all classes, you get to eat what you cook. There are 4 main cooking schools at Blue Lagoon, Napalai, Kati Culinary and Thai Cooking School, all based in the Klong Prao area on the west coast. Happy Turtle in Bailan also sometimes runs its own classes in the restaurant when not too busy and Pekan at Bamboo Hut Restaurant on Bang Bao Beach is another option. Classes are small with around 8 to 10 people the maximum, with you each assigned your own individual workstation and gas ring. At Blue Lagoon Cooking School or Kati Culinary, the cooking classes run throughout the day from 11.00am to 16.00, with an evening class also possible at Blue Lagoon. 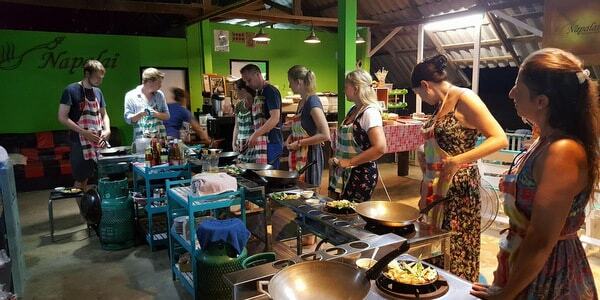 You can take shorter courses, morning, afternoon or evening at Napalai Cooking School and Koh Chang Thai Cooking School. Transfer between your resort and the cooking school is included in the price. You may also receive a recipe booklet or certificate. Why not Contact Us and we will organise everything for you, nothing for you do other than exchange a few emails, so we know exactly the date, numbers and so on, then pay when when you get here. We work with all the schools. Yaa at Blue Lagoon has been running her cooking school for well over a decade in a delightful location by the water. The day class from 10.00am to 16.00 is a wide-reaching introduction to Thai cooking covering all the ingredients, culture and traditions. Practical tuition includes pastes as well as 5/6 dishes decided beforehand by the class, then prepared and cooked. The evening class is shorter, with the emphasis on preparation and cooking the evening meal. Bunny at Napalai runs 3 classes a day in a family friendly relaxed spot in the back of Klong Prao. With dishes ranging from pork with holy basil to chicken and cashew nut, from curries to Thai salads, she covers all your favourite choices. Morning classes run from 09.00am to 13.00, afternoon from 14.00 to 17.00 and evening from 18.00 to 21.30. Klong Prao, midway to northern end Cookery school at one of the island's very best restaurants. 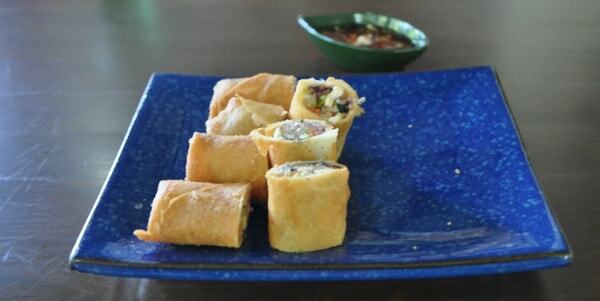 4 dishes normally prepared - say, spring rolls, penang curry, pad Thai and banana dessert. Professional, full of expertise and fun. 10.30am to 3.30pm with maximum of 10 persons. Klong Plu, interior in Klong Prao Lovely location inland, with Teacher Nam in charge of a small kitchen teaching 3 programs, with 6 dishes in each, anything from curry pastes to tom yam or tom kha, laab, somtam, pad siyu to mangoes and sticky rice. 9.00am to 1.00pm or 2.00pm to 6.00pm/maximum of 10 persons.